Active Dreamers are often reminded to “be kind to dream fragments.” In other words, we are encouraged to process a small dream image as seriously as a longer dream, for they may hold important messages or might be a source of inspiration and wisdom. But what about a single word or number? Recently, while attending an Active Dreaming retreat at Garnet Hill Lodge on Gore Mountain with dreamers from around the globe and dream shaman, Robert Moss, I had a dream that will forever change my notion of how important a tiny dream wisp can be. On the first night of our weekend I had a dream that was simply about the number eighteen. No story line, no image, no description or additional words. I woke up with the number eighteen on my mind, realizing it was the second time it had popped into my mind during the night. I had no association for the number and discounted it immediately. Later that morning, while sharing dreams with others I casually said, “I only dreamed about the number 18.” Then I tried to switch the conversation to a dream I had from a previous night. I still tried to throw the dream fragment away, intent upon sharing a longer more interesting dream with the group that had gathered. I hesitated. I could not think of one thing other than how glorious I felt when I had finally turned 18 years old…decades ago. He went on to explain what the moon card meant for him. Today I remember only one word he used in his “if it were my dream” comments. That word was “Illusion” and then the words quickly added at the end of his description, “It’s a good thing.” At the time I felt relieved because I had associated the moon card with a somewhat shadowy interpretation. I left the breakfast table, stunned by the coincidence. I had just taken a gorgeous photo of the full moon setting over the 13th Lake upon waking. It took a bit of time to process the notion of how I had dreamed of the moon card number at the same time there was a full moon, not knowing eighteen was the number on that card. One thing I knew for sure; my tiny dream had drawn my attention to the moon card, and I needed to determine its meaning for me. Active Dreamers often find elements of a dream worthy of research. We call this process “Dream Archaeology.” So I decided to do a bit of my own archaeology with the moon card. 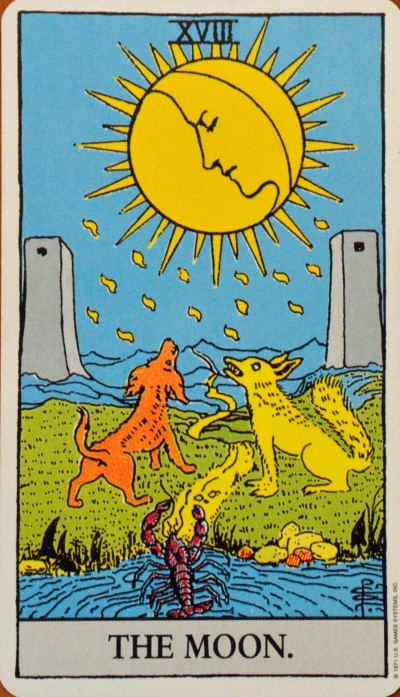 Before reading about what online “experts” had written about the card’s meaning, I decided to take closer look at the image on the moon card as depicted in the Rider-Wait Tarot deck. I wanted to intuit what the image said to me with the knowledge I already had before applying the meanings assigned by others. Here is what I saw in the Moon card. The moon reflects the light of the sun; it doesn’t have light of its own. So in that sense its light may be considered an illusion. Can a person depend upon only reflected light to provide consistent illumination for any endeavor? The moon in the image is full, yet there is a sliver of a moon phase embedded within its fullness. I am reminded that like the moon, our life cycle waxes and wanes in association to each of its stages. There also remains the dark side of the moon hidden from view, and I wonder what might be concealed from my awareness in the veiled shadow or in its projections that I may make upon others. A profile face reflectively gazes down upon the twists and turns of a path originating in the pond and disappearing in the distant mountains. Her expression might be one of concern for a potential traveler or one of protection. The rays, like thoughts or prayers, fall upon the scene. There is always a sense of peace when I view the face in a full moon. The path appears to depict an arduous journey, perhaps symbolizing the evolution of a soul’s growth. The crayfish creeps up from beneath the water’s surface and attempts to traverse a previously unknown world. Its fragile nature is hidden beneath a shell, backed by threatening claws. Something I’d like to push back beneath the rippling pond. The path leads past a barking dog and howling wolf, perhaps representing aspects of fear and confusion, the negative sides of one’s nature. Then the path passes through two observation type towers, maybe places of higher vision or possibly symbols of “either/or” polarity. They represent for me the entrance into the mysterious interior lands. Here the path winds long into the mountains, perhaps ending in a place of spirit and upper world consciousness. I see that every journey has its challenges and never travels a straight line. Journey: We want to control how a path unfolds and avoid its obstacles and trials. We must imagine possibilities without trying to make things happen. Inner intuitive light is the best guide for taking those first steps on foreign soil, for facing challenges and making choices, and for navigating the hidden lands. Illusion: We tend to weave stories around our judgments which become illusionary limiting beliefs, deceptions. We must release them if we are to have clarity of vision for discernments. Fear: We tend to blame and attack others. These responses are rooted in fear and tend to be projections. We must learn to respond to external situations from a place of peace and by understanding the nature of the shadow. Evolution of consciousness: We want to hurry toward a destination without addressing the challenges of growth and the deeper meanings of experiences along the way. All phases and stages must be experienced. We cannot not skip ascending steps in our soul’s illumination. During the past several years I have been attending the gatherings on Gore Mountain, gatherings that began 23 years ago, long before I had heard of Active Dreaming. Each time I’ve attended one of these heart-centered retreats, something magical occurs, like this fall’s photo of the setting moon and then learning more about Tarot through a coincidental dream. When I return home I pack in my suitcase new insights about perception, visioning and dreaming. Finally, my experiences always come with an added bonus, deep connections to others who share magical journeys in creativity, healing and dreaming practices. Special Note: The Rider-Waite Tarot is the most widely recognized Tarot deck, and the first deck published in the 20th Century.